Kids are told time and time again that wisdom needs to be listened to and that they should prize the folks who have walked the world longer than they. Give the elders respect and adhere to the insight that they have to give. Do what they say! That's a lot of almost oppressive obligation for a kid to listen to and many are going to resist the effort. They might even try to come up with ways to turn the tables. Of course, a particularly clever tyke might just turn that entire thing up on its end and transform into your old folks in order to get away with all sorts of trouble. It isn't that we want to encourage such behavior or would delight in hearing the story of what happened, but... that's definitely true! And we're pretty sure that your kiddo (and even you) will love the whole experience. 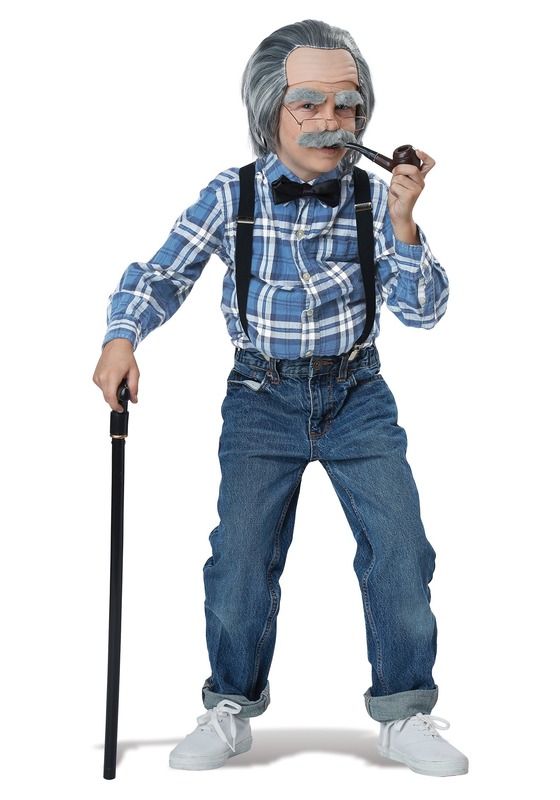 Let your tyke see just what it is like to be walking around on aching bones when you help them transform into a cranky old man with this Old Man Boy's Costume Kit. This set of wavy gray wig, old-fashioned bow tie, and clip suspenders will give your kiddo the beginnings of a quantum leap! Before long, they'll be looking for their walking cane, demanding their rocking chair, and offering you some Werther's Originals while telling you tales from the old days back on the recess fields of elementary school! You'll be able to enjoy watching your kid hobble around and demand that all the "young kids" get off their lawn when they transform into a crotchety old man with this disguise kit. How often can you give your kiddo the opportunity to see life from another person's perspective without it involving a weird cursed object or misspoken wish that turns into a Freaky Friday kind of situation!? Take this opportunity while it is available!